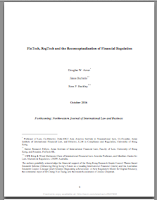 HKU Legal Scholarship Blog: Arner, Barberis & Buckley's "FinTech, RegTech and the Reconceptualisation of Financial Regulation"
Arner, Barberis & Buckley's "FinTech, RegTech and the Reconceptualisation of Financial Regulation"
"FinTech, RegTech and the Reconceptualization of Financial Regulation"
We argue that the transformative nature of technology will only be captured by a new approach that sits at the nexus between data, digital identity and regulation. We seek to expose the inadequacy and lack of ambition of simply digitizing analogue processes in a digital financial world. The development of financial technology (‘FinTech’), the rapid developments in emerging markets, and the recent pro-active stance of regulators in developing regulatory sandboxes, all represent a unique combination of events, which could facilitate the transition from one regulatory model to another. 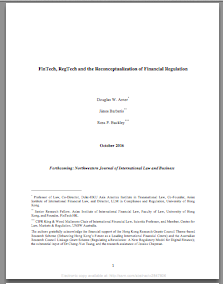 This paper sets the foundation for a practical understanding of RegTech and proposes sequenced reforms that could benefit regulators, industry and entrepreneurs alike in the financial sector and other industries. Click here to download the full paper. The paper was cited recently in Andrew Cornell, "Robocops on the regulatory beat", ANZ BlueNotes, 12 October 2016. The paper is the fifth most downloaded paper in the SSRN Legal Scholarship Network in the past 60 days. Arner and Barberis presented the paper at a seminar organised by the Asian Institutional of International Financial Law on 10 November 2016 at 12:15pm, 11/F, Cheng Yu Tung Tower, HKU, Pokfulam Road, Hong Kong. See above for the video of this seminar. The paper was cited by John Humphries in his Forbes article, "The Rise of RegTech and What it Means for Your Business", 14 December 2016.